Home Services is a mortgage firm offering real estate services. The company offers all kinds of real state services including mortgage, insurance, brokerage, relocation, title and escrow services and franchising. 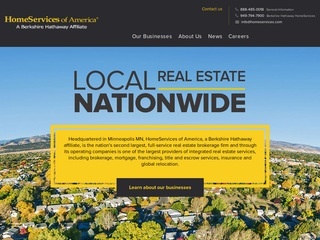 Based in Minneapolis MN, Home Services is affiliated to Berkshire Hathaway. The company, operational since 1998, has been helping hundreds of clients tide over real estate problems with ease, thanks to its services.